OLED and augmented/virtual reality technology reigned supreme at the 54th Annual Display Week at the Los Angeles Convention Center, where nearly 7,000 attendees joined us in the City of Angels to take in the latest and greatest products in these exciting fields  and all other things display. In addition to being the most popular booths at the exhibition, AR/VR and OLED drew large crowds during the highly anticipated Business Track conferences and educational sessions, where global thought leaders shared valuable insights and forecasts that attendees are still talking about. Watch the video. For the public, our in-depth conferences and special sessions appear as seamless experiences where they can learn from and connect with top industry icons  but their success is due to the hard work and dedication of our expert team: Conventions Chair (Technical Conference) Paul Drzaic of Apple, Inc.; Conventions Co-Chair (Business Conference) John Jacobs of Intel Corp.; General Chair Seon Ki Kim of Sungkyunkwan University; Program Chair Rashmi Rao of Harman International; and Conventions Chair (Exhibits) Aris Silzars of Display Technology Consulting. The kinetic energy at Display Week 2017 was palpable throughout the week  from the 200+ exhibitors that showcased their best to the highly anticipated Technical Symposium, I-Zone, business conferences and exclusive forums and networking events. Attendees from all over the world had the chance to experience newest sights and sounds in the marketplace, and network with world-renowned experts, visionaries, scientific pioneers and inventors who are creating tomorrows technology today. At this years event, we made room for even more to see and do -- expanding our overall exhibition space by more than 9% over 2016, and increasing the New Product Showcase area where attendees found exciting previews of the floor exhibitions. We also received a 15% increase in technical papers that contributed to the symposium offerings, as well as double the submissions for the exclusive I-Zone, our exhibition-within-an-exhibition, which demonstrates the worlds most exciting prototypes that havent yet hit the marketplace. Keeping things on the leading-edge, we hosted several exclusive panel discussions, including the first Women in Tech forum, where female industry leaders took center stage; a special OLED 30th Anniversary session to celebrate this pioneering and enduring technology; and our returning CMO Forum, where global leaders shared sales and marketing tactics and insights. Additionally, we hosted a new automotive conference to address some of todays fastest-moving technology and created special professional learning opportunities, like the first ICDM metrology course that complemented our Sunday Short Courses and Monday Seminars. We honored industry luminaries at our Monday night awards banquet and the most progressive display technologies at our annual Display Industry Awards luncheon; and attendees and exhibitors alike also enjoyed our special networking event at the world-famous GRAMMY Museum where they lingered among the legends of music from Elvis and Ella to Michael and Madonna. 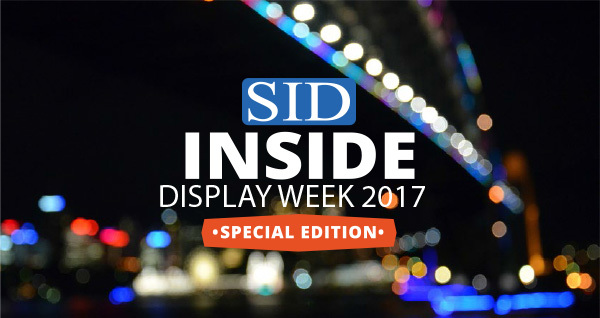 For those of you who joined us, this special edition of Inside Display Week 2017 will be a fond trip down memory lane and an eye-opening experience for things you didnt have a chance to see. For those of you who missed it, you now have every reason under the California sun to join us next year when well be back in L.A. for Display Week 2018, May 20-25, 2018. Mark your calendar now, and start planning your star-studded trip! Left to right: Women in Tech panel members Dr. Julie Brown, Sr. Vice President and CTO, Universal Display; Candice Brown Elliott, CEO, Nouvoyance; Heidi Dohse, Vice President of Product Execution, DTI Holdings; Laura Rea, Senior Technology Program Manager, U.S. Air Force Research Laboratory; and Dr. Niaz Abdolrahim, Assistant Professor of Mechanical Engineering and Materials Science, University of Rochester. Five top female technologists took center stage at the debut of the Women in Tech panel discussion on May 24. Over 100 attendees turned out to hear from longtime entrepreneurs, researchers, and scientists about the state of technology for women, their significant contributions to the field despite the challenges they faced during their careers and how they see the future. Watch the videos of both Part 1 and Part 2 to see the entire session. Other panel members included Dr. Julie Brown, Sr. Vice President and CTO, Universal Display; Candice Brown Elliott, CEO, Nouvoyance; Heidi Dohse, Vice President of Product Execution, DTI Holdings; and Dr. Niaz Abdolrahim, Assistant Professor of Mechanical Engineering and Materials Science, University of Rochester. The discussion was followed by a Q&A session, where participants sought insights about a wide range of subjects, including career strategies. Women in Tech will be back at Display Week 2018 with an equally impressive and informative panel. You wont want to miss it! Dynamic industry leaders played to a full house during the keynote presentations at Display Week 2017. Clay Bavor, Vice President of Virtual Reality at Google, Inc., Sanjay Dhawan, President, Connected Services at Harman International/Samsung, and Paul Peng, Chairman and President of AU Optronics Corp. each shared their personal experiences and professional acumen and homed in on todays hottest topics. From answering some of the industrys most pressing questions about TFT, to offering perspectives on how to truly achieve immersive experiences in AR/VR and addressing the challenges of how to humanize the autonomous car experience - our keynotes gave their all to an eager audience. During his presentation, Mr. Bavor announced for the first time that Google has collaborated with a leading OLED manufacturer on new, ultra-high-resolution displays for virtual reality glasses that will offer up to 20 megapixels per eye. Click here to find out more about this exciting topic from Mr. Bavor. 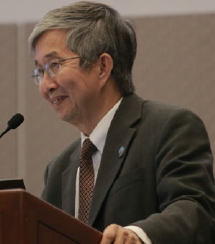 You can also visit our YouTube channel to see the illuminating keynote discussions from Mr. Peng and Mr. Dhawan. After a highly competitive application process that yielded more submissions than ever, a record-breaking 53 exhibitors joined us in the I-Zone to showcase the planets newest prototypes of products that will change the way we live, work and play. Check out the video. Sponsored by E Ink, the I-Zone gave attendees the chance to get up close and personal with the latest in auto display technology, flexible displays, wearables, holograms and more. I-Zone Best Prototype Award winners (from left to right) Holger Baur, David Duhme, Christiane Jasmin Reinert-Weiss, and Norbert Fruehauf, with I-Zone Chair Harit Doshi of E Ink (far right). IGM, University of Stuttgart, who partnered with Hella KGaA Hueck & Co., was selected as the winner of the 2017 Best Prototype award for its novel headlamp with fully adaptive, driving beam technology that incorporates both active-matrix LCD and LED technologies. The I-Zone offers start-up companies space to demonstrate their prototypes or other hardware demo units for three days, free of charge. The competition is open to small companies, startups, universities, government labs, and independent research labs. Display Weeks Technical Symposium is one of the worlds most highly anticipated and well-respected forums, featuring a whos who of the display technology industry where attendees have the rare opportunity to learn about state-of-the-art advances from global leaders not often seen in one place together. The number of submitted papers increased by more than 15%, which meant increased access to the latest discoveries and forecasts in the four special topics that were focused on emerging technology in these areas: augmented and virtual reality, digital signage display solutions, display materials and processes and wearable displays. 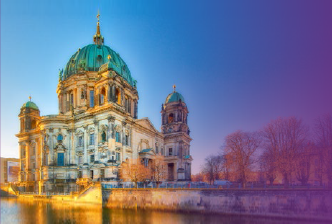 The Display Week Technical Symposium is an extraordinary opportunity focused on the most novel approaches in key market areas for the entire technology chain related to displays  from fundamental materials and devices to system integration and applications. Weve also recently expanded topics to include artificial intelligence and novel materials. Every year, the symposium attracts global audiences interested in understanding the latest advances and forecasts in display technology. In addition to being shown to a worldwide audience at Display Week, these advancements are discussed in detail in the SID Symposium Digest, one of the most cited publications in display-related fields. Submission for original papers on all aspects of the research, engineering, application, evaluation, and utilization of displays are encouraged. Submissions relating to the special topics are also highly encouraged. Three decades have passed since we were first introduced to organic light-emitting diode (OLED) technology, and its hard to imagine where we would be without this fascinating discovery that serves as a foundational component to so many other technological advances. At a special session devoted exclusively to this topic, industry pioneers Ching Tang and Steve Van Slyke, who co-authored a ground-breaking first paper on OLEDs, were joined by a high-profile panel of expert speakers including Dr. Rajeswaran Gopalan, Dr. Julie Brown and Dr. Chris Brown who kept the audience at rapt attention as they discussed the humble beginnings and exciting future of OLED. The CMO Forum returned for its second year with an all-star line-up that did not disappoint. Justin Kalvitz, Sr. Vice President of Kent Displays; Sri Subramanian, Sr. Vice President of Technicolor; Mark Verrall, Sr. Vice President of Merck and Bahar Wadia, CEO of Visionox, USA, addressed the topic of When Content Meets Display, and discussed the challenges and opportunities for sales and marketing professionals when these two interdependent worlds collide. Sri Peruvemba, SID Board Member and Chair of Marketing, moderated the event. Watch the video and hear the insights from this quartet of visionaries. Hob-nobbing with industry icons, colleagues and peers at Display Weeks special networking event is always one of the highlights of the week. And this years event was no exception! Sponsored by BOE Technology Group Co., Ltd., this special cocktail party and reception took place at the world-famous GRAMMY Museum, where visitors had a spectacular roof-top view of the city and were treated to a wonderland of musical history on three floors of this unique interactive venue. Michael Jacksons famous sequined gloves, Elvis guitar, Ella Fitzgeralds hit records, hand-written lyrics to famous songs, and the opportunity to play instruments and form your own impromptu band were but a few of the highlights of this once-in-a-lifetime experience. Display Week will be back in L.A. again in 2018 - and you can be sure our special networking event will rock n roll just as much! 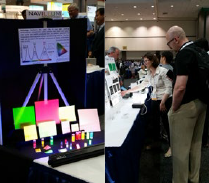 The annual Display Industry and Best in Show Awards honor the most significant advances in display technology and systems, products, prototypes and manufacturing processes presented by exhibitors at Display Week. Best in Show winners are chosen for their ability to generate excitement within the display industry, along with the general public, global media and analyst communities. This years winners were selected from more than 200 exhibitors. Jaejoong Kwan of Samsung Display (left) and Wei Chen, chair of the Display Industry Awards Committee. CLEARink for its video-capable e-Paper display See the technology. Our traditional Monday night ceremony honored the following individuals who have made outstanding contributions to the field. Left to right: Shin-Tson Wu, chair of the Honors and Awards Committee, Sarah Brody Webb and Yi-Pai Huang, winner of the inaugural Peter Brody Prize. Every year, Display Weeks annual Business Track offers several outstanding conferences that get inside the world of displays and show you how to navigate the marketplace of this $100+ billion industry. These day-long sessions feature multiple presentations from global experts who share the newest thinking and cover the full spectrum of what you need to know about the business end of the display business, and how to thrive in a highly competitive, rapidly shifting environment. Our exclusive conferences were the place to be this year, whether attendees wanted to find out about the state and trajectory of AR/VR wearables or what investors are looking for in the next big thing, or how to ensure successful supply chain management. And - because Display Week is committed to showing the latest advancements in the field - this years Business Track revved up the motor with the new Automotive Display Market Focus Conference that focused on key elements of one of todays most important, emerging arenas. Topics included flat panel displays for multiple locations in the vehicle, touch panels and interactivity, and head-up displays and augmented reality. Dont be left in the dust behind your competition. Mark your calendar now and start making your plans for Display Week 2018 today! 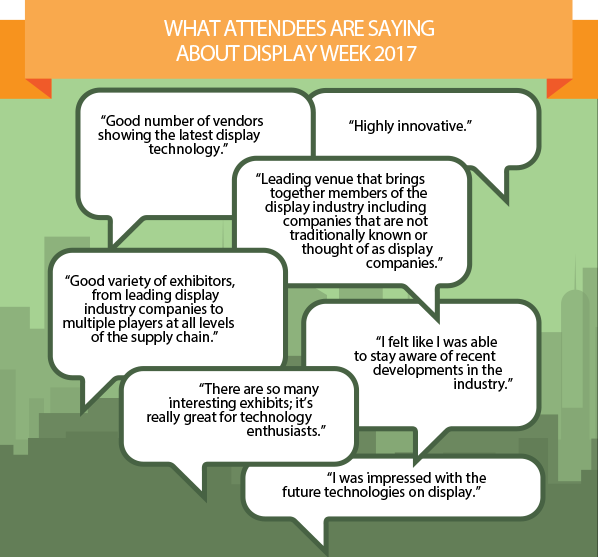 Display industry market leaders, manufacturers, product developers, and sales and marketing professionals from around the world all know where to go when they want to share their new technology, products and prototypes with the right audience: Display Week! More than 250 exhibitors and I-Zone participants joined us in Los Angeles to demonstrate the latest and greatest in the field. From flexible displays, wearables and AR/VR technology to AMOLED, quantum dots, auto displays and e-Paper - and everything in between - Display Week had it all. Its no wonder we had to increase floor space by more than 9%! Check out this video of the exhibition floor. Were already preparing to make next year even bigger and better. For 2018, weve added an additional 2,000 square feet of exhibition space and - in fact - nearly 80% of the floor space is already reserved. That means therell be more to see, touch, test and talk about. If youre interested in reserving your exhibit space for Display Week 2018, please contact a member of our team before the remaining booth space is taken. If youd like to receive updates about Display Week 2018 exhibitors and other event news throughout the year, sign up for the SID newsletter. Display Week always brings out some of todays top-tier media and analyst communities, and this year stayed true to form. The weeks events and exhibits were extensively covered by a wide variety of representatives from print and broadcast, key electronic and display trades, and bloggers and market researchers from across the globe. 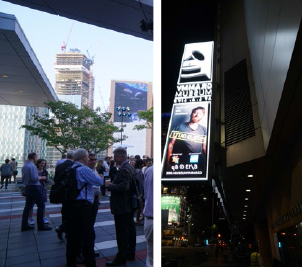 With more than 50 media on-site in attendance, publication representatives included Time Warner, ECN, Golem.de, Nikkei, Electronics Times, Display Daily, and Consumer Electronics Daily, just to name a few. Display Weeks location in Los Angeles offered exciting opportunities for local media, many of whom made their first visit to Display Week, to discover the technology at the show. Display Week and its exhibitors witnessed solid coverage among key outlets, largely in part due to a lot of exciting news generated from companies showcasing their latest display innovations. In fact, more than 4,000 articles have appeared and the coverage continues to pour in from around the world. For a look at some of the coverage, click here. Display Week also continued to grow its social media presence this year, launching several new social media initiatives on Instagram and SnapChat, and continued to promote efforts via its other platforms, such as Twitter, LinkedIn, YouTube and Facebook. We witnessed a significant increase in engagement and audience contributed posts  and thank those attendees and exhibitors that helped us elevate our profile. Our social media platforms continue to be a source for industry news, video highlights from the show and all things Display Week. So even though the show has passed, dont forget to continue to share your display industry insights with our growing social media community and keep the excitement going. 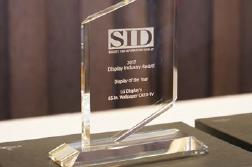 All year long, SID posts has been posting informative blogs about trends and advancements in the display industry. If you havent had a chance to check out the SID Dispatch, take a moment now and see what youve been missing. If you would like to contribute to SID Dispatch or have topic suggestions, please send an email to info@leavcom.com. Nows your chance to check out the industrys leading and most prestigious publication, the Journal of the Society for Information Display. The journal publishes original works dealing with the theory and practice of information display. Coverage includes materials, devices and systems; the underlying chemistry, physics, physiology and psychology; measurement techniques; manufacturing technologies; and all aspects of the interaction between equipment and its users. Use this direct link to view this special issue until December 31, 2017. Youre receiving this email because youve signed up to receive updates on SID. If youd prefer not to receive updates, you can unsubscribe. © Copyright 2011-2017 SID - All rights reserved. In closing, SID would like to thank its Display Week 2017 corporate sponsors, along with its media/trade association partners. Companies interested in sponsorship opportunities at Display Week can contact Jim Buckley or Sue Chung, and media or trade associations can contact DisplayWeekPR@mcapr.com.